KQED and The Center for Investigative Reporting partner on specials to air October 10 and 11 on television and radio. 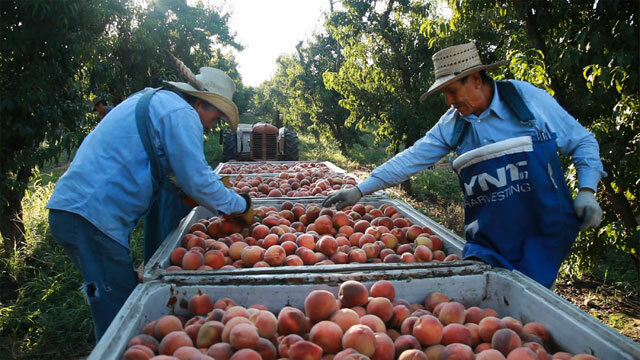 California’s San Joaquin Valley is the country’s most productive farm belt: its fertile orchards and fields generate most of the nation’s fresh fruit and nuts. Yet for the people who work and live near these farms, access to healthy and fresh food is a daily struggle. KQED and The Center for Investigative Reporting (CIR) launch Hunger in the Valley of Plenty, a multi-platform partnership that paints an intimate portrait of the way Central Valley families with limited means cope with issues of poor nutrition, obesity and diabetes. The programs also explore the people and organizations fighting to inject local fresh produce into the emergency food system and school lunch programs. For all features and other resources, please visit kqed.org/hunger. The television special Hunger in the Valley of Plenty examines the broken food system in California’s San Joaquin Valley, and its health impacts for some of the state’s poorest residents. The special paints an intimate portrait of a farmworker family struggling with access to healthy and affordable produce, despite the fact that it grows all around them (reported by Sasha Khokha, KQED Central Valley Bureau Chief); takes a hard look at the attempts to improve the Central Valley school lunch system, which mainly serves prepackaged and processed foods (reported by Natasha Del Toro, CIR); and introduces a grassroots effort to rescue produce from farms and teach low-income residents in the town of Pixley how to incorporate it into their diet (reported by Khokha). The television special is produced by Scott Anger; the executive producers are Joanne Elgart Jennings, Victoria Mauleon and Steve Talbot. Jessica Ortiz struggles to figure out what to feed her five kids while her husband works in the vineyards and almonds orchards. The only place to buy food in her hometown Raisin City is an overpriced mini-mart that sells wilting produce and lots of cheap junk food. This feature paints an intimate portrait of the barriers to accessing healthy and affordable food for the families that harvest California’s produce. An estimated one in three children in the Central Valley lives in a home that experiences “food insecurity” — not knowing where their next meal is coming from. Food banks, which mainly serve packaged food, have become a primary source of nutrition for many families. This feature looks at the Tulare County Food Bank’s decision to stop accepting donations of sugary snacks and drinks, in an effort to combat the region’s chronic obesity and diabetes. A recent survey of Central Valley farms from the Natural Resources Defense Council estimates as much as 30 percent of certain crops go to waste in the fields. This feature introduces us to Sarah Ramirez, who grew up in a farmworker family and went on to earn her PhD at Stanford. During her stint as Tulare County’s epidemiologist, she grew frustrated with the lack of action to address poor nutrition in Valley towns. Ramirez has returned to her hometown of Pixley to rescue unwanted produce from farms and neighborhood backyards. Fifteen-year-old Jane Carretero is the daughter of farmworkers and lives in West Fresno, where fast food abounds, but fresh food is scarce. This audio diary chronicles her struggle to eat healthier during her pregnancy. Produced in collaboration with The kNOw Youth Media, a project of New America Media. Using Storify, young people from around the Central Valley will share Instagram photos and stories about their daily diets, including school lunches. Produced in collaboration with The kNOw Youth Media, a project of New America Media. A comprehensive package including all of the radio and television elements will be also available online at kqed.org/hunger. Hunger in the Valley of Plenty is the seventh special to come out of KQED and CIR’s multimedia partnership. The two news organizations most recently produced Life After War: California Veterans, which investigated the challenges faced by soldiers upon their return home; A Church Divided, which took a close look at homosexuality and Christian doctrine; Prison Break, which looked into the impact of Governor Jerry Brown’s far-reaching efforts to overhaul California’s prison system; Republic of Cannabis, which explored California’s marijuana trade; and On Shaky Ground, an investigation into the seismic safety of public schools that prompted calls for change. One more special is scheduled for 2013. KQED serves the people of Northern California with a public-supported alternative to commercial media. Home to the most listened-to public radio station in the nation, one of the highest-rated public television services and an award-winning education program, and as a leader and innovator in interactive technology, KQED takes people of all ages on journeys of exploration — exposing them to new people, places and ideas. While other news organizations have shrunk, KQED has expanded its efforts to cover the issues and events that are important to the Bay Area. As the most trusted source of news in the Bay Area, KQED is a multiplatform operation with offices and bureaus in San Francisco, San Jose, Sacramento, Fresno and Los Angeles. KQED News programs include KQED NEWSROOM, current affairs specials produced in collaboration with The Center for Investigative Reporting, The California Report, Forum with Michael Krasny, 18 news broadcasts on KQED Public Radio daily and the popular blogs News Fix, State of Health, Mindshift and The Lowdown. Stories from all KQED news programs are featured online at KQEDnews.org. Investigative reporting is an essential pillar of a democratic society. For more than three decades, The Center for Investigative Reporting (CIR) has relentlessly pursued and revealed injustices that otherwise would remain hidden from the public. Today, we’re upholding this legacy and looking forward, working at the forefront of journalistic innovation to tell the stories that make a difference and reach diverse audiences of all ages, across the aisle and worldwide. CIR stories appear in hundreds of news outlets, including NPR News, PBS NewsHour, Frontline, CNN, the Los Angeles Times, The New York Times, The Washington Post, the San Francisco Chronicle, The Sacramento Bee, The Daily Beast and American Public Media’s Marketplace. CIR stories have received numerous journalism awards, including the Alfred I. duPont-Columbia University Silver Baton, George Polk Award, Emmy Award, Investigative Reporters and Editors Award, and the MacArthur Award for Creative and Effective Institutions. Its reports have sparked state and federal hearings and legislation, public-interest lawsuits and changes in corporate policies. For more information, please visit cironline.org. In 2006, over 25 youth began participating in weekly afterschool writing workshops where they congregated in the hallway of a two-story building in West Fresno and learned the essentials of creating media and telling their stories. Seven years later the group has emerged into what the community now proudly recognizes as The kNOw Youth Media! Through our program, we create opportunities for our youth participants, who in turn create long-term positive change in their communities. Our approach weaves youth development and youth media innovation to produce our biannual youth publication, multimedia projects, and community forums. The kNOw Youth Media one of eight youth and community media programs founded by Pacific News Service/New America Media (NAM), a non-profit news organization headquartered in San Francisco that began 40 years ago as an alternative news service for mainstream newspapers during the Vietnam War, and which has evolved to become a multi-media organization dedicated to serving the national ethnic media sector and building inclusive communications in a global society.